Conceived as the armored cruiser equivalent of the Deutschland-class battleships, Scharnhorst and her sister Gneisenau marked a shift in German warship design as the High Seas Fleet finally sought ships at least equal if not superior to those built by other navies. Admiral Alfred von Tirpitz, the Imperial Navy’s state secretary, pushed the Deutschland class forward as quickly as possible, not wishing to entertain proposals for a larger and more capable design as that would require widening the Kiel Canal between the North and Baltic Seas. The resulting ship repeated the previous class to a large extent, and was much smaller, slower and more weakly armed than contemporary foreign battleships. But Tirpitz had five of them, and numbers counted more than firepower in his Risk Theory. While Tirpitz is remembered for that flawed Risk Theory and his related obsession with battleship construction, he actually came up through the ranks as a cruiser commander. German armored cruisers were intended for service on overseas stations rather than with the High Seas Fleet in the North and Baltic Seas, and an ability to transit the Kiel Canal counted for far less than it did for a battleship. Scharnhorst could therefore be larger than Deutschland, and represented an enormous leap forward in fighting power over her predecessor, the armored cruiser Roon. To start with she was much larger, displacing just under 13,000 tons (compared to 9,500 for Roon). She measured 144 meters long, compared to 127 meters for the older cruiser (the same 127 meters as battleship Deutschland). At the time she was laid down, Scharnhorst was the most expensive warship ever ordered in Germany (a record immediately broken by her successor, Blücher). Roon had carried four 210mm (8.2-inch) L/40 heavy guns in a pair of twin turrets, one forward and one aft. Scharnhorst kept those and added two more on either beam, in casemate mounts within an odd pyramid-like armored citadel. She added six 150mm (5.9-inch) guns in the citadel, three on either beam; Roon had ten of them (Scharnhorst’s designers essentially replacing four 150mm guns with 210mm weapons). The 210mm L/40 had been used since the Victoria Luise-class protected cruisers laid down a decade earlier; the Prinz Adalbert- and Roon-class armored cruisers had the same model twin turret as Scharnhorst. It had middling range (16,300 meters in a turret mount, 12,400 for the casemate-mounted guns, which had much less elevation), but did slightly out-range the crapulent 9.2-inch guns of British armored cruisers. The next German armored cruiser, Blücher, replaced these weapons with the far more effective L/45 model, but this gun had not been designed when Scharnhorst and Gneisenau were laid down. For defense against enemy torpedo attack, the new cruiser carried eighteen 88mm (3.46-inch) guns, with eight of them mounted in fairly useless casemates in the hull, half well forward and half well aft, and ten in shielded mounts on the deck. She also had four torpedo tubes, one each at the bow, stern and either broadside. The ships carried 88 rounds per 210mm gun, a slight decrease from Roon and far fewer than they would need. The big guns had centralized fire control, but the 1550mm and 88mm were each individually trained and fired. Scharnhorst also had substantially heavier armor than earlier armored cruisers, with a teak-backed belt almost twice as thick as that of Roon, slightly thicker armor on her turrets and about the same level of deck armor. Like all large German warships, she had “honeycomb” internal subdivision (with 15 watertight compartments) and a double bottom. After all of those improvements, Scharnhorst carried a power plant similar to that of Roon, though enlarged to offer more horsepower and greater speed (a designed speed of 22.7 knots, compared to 21 knots for the older cruiser). Both Scharnhorst and Gneisenau exceeded their projected power output and top speed on their initial trials. She had small-tube boilers, but triple-expansion engines rather than turbines. That gave Scharnhorst substantially better speed than pre-dreadnought battleships and most other armored cruisers, but left her well behind the new turbine-powered British battle cruisers. Gneisenau was actually laid down first, on 28 December 1904, with Scharnhorst following six days later. At the time, no major warship had been built with turbines and their power plant represented standard technology. 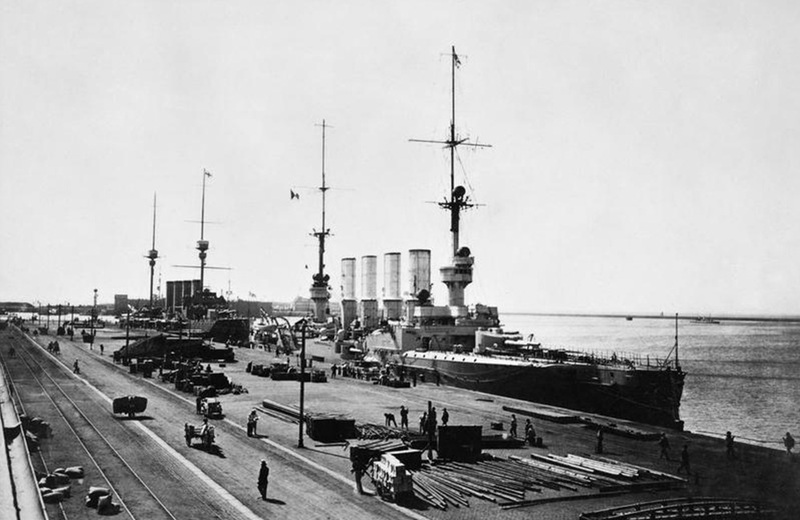 All of that changed during their construction; the British Invincible-class battle cruisers appeared about a year after Scharnhorst and her sister’s commissioning, with a main armament of 12-inch guns and turbines driving them at 25 knots (and, thanks to British shipyard efficiencies, they cost slightly less than Scharnhorst). Scharnhorst (right) and the British armored cruiser Minotaur at Tsingtao, June 1914. Both Scharnhorst and Gneisenau spent their first years with the High Seas Fleet’s scouting forces before deploying to the East Asia Cruiser Squadron to relieve the long-time flagship Fürst Bismarck, which returned to Germany for re-construction. Before their deployment Scharnhorst suffered serious damage in a grounding incident that shaved two knots off her top speed. Their arrival in the Far East prompted the Royal Navy to deploy their own new armored cruiser Minotaur to the China Station, a powerful ship built as a “reply” to Scharnhorst but likewise rendered obsolete by the advent of the battle cruisers. The German ships would show their superior gunnery training when they annihilated a British cruiser squadron at the Battle of Coronel in November 1914, but when facing British battle cruisers a month later off the Falkland Islands they could not effectively reply and were both sunk. In game design terms, Scharnhorst and Gneisenau occupy an in-between position in Great War at Sea. While Scharnhorst’s grounding damage drops her firmly into the “1” speed category, Gneisenau comes close to rating a “2” (at least before the maintenance problems and fouled hull of her long trek across the Pacific). When we published the first edition of Cruiser Warfare, many armored cruisers with –inch to 9.2-inch main guns received a “nominal” single primary gunnery factor, an unsatisfactory compromise that we rejected in later Great War at Sea games. We provided new pieces for both Scharnhorst and Gneisenau (and many other British and German armored cruisers) in High Seas Fleet, along with the “homecoming” scenario for Spee’s squadron I’d long wanted to include somewhere. We included two additional sister ships for Scharnhorst in our Golden Journal No. 26; while Tirpitz wanted these ships, he did not request them and instead asked for six units in the following Blücher class rather than four from each class. 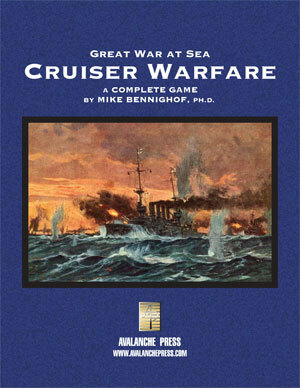 You can order Cruiser Warfare right here.